If there was just one thing I could show someone seeking to understand the Serbs, I would take them to a hill northeast of Niš (Ниш), and show them the Skull Tower. Though Serbian medieval statehood was mortally wounded in the battle of Kosovo (1389), its last embers were smothered in 1459, as the conquering Ottoman Turks swept into Europe again following their conquest of Constantinople. For the next three centuries, Serbs lived under the Ottoman yoke. Some converted to save their lives and property. Some sough refuge in remote areas, or the Austrian and Hungarian borderlands. Others trudged on, bowed but not broken, all the while hoping for freedom. Though there were previous attempts to liberate Serbia, none lasted very long until the rebellion led by Karađorđe (Карађорђе, Black George) in 1804, known as the First Serbian Uprising. Not until 1813 were the Turks able to end the rebellion - in blood, as usual. In May 1809, at the height of the uprising, a force of Serb fighters was advancing on Niš, then an Ottoman stronghold. Told of the approach of a Turkish relief force, they dug in on the hills northeast of town. On May 31, the Turks attacked the redoubt on Čegar Hill and broke the Serb line. In the last desperate act of defiance, Serb commander Stevan Sinđelić (Стеван Синђелић) shot at the gunpowder barrels in the redoubt, blowing up himself and the rearguard but also the advancing Turks. This enabled the remaining Serbs to withdraw. The Ottoman commander of Niš, serasker Hurşid Ahmed Pasha (a Christian from the Caucasus, enslaved as a child and sent into the Janissaries), offered a prize on the rebel heads, then had them skinned, stuffed, and sent to the sultan as trophies. Then he built a tower of brick and mortar, and mounted the flayed skulls in windows made for that purpose. The result was Skull Tower (Ћеле-кула), intended to strike fear into the Serbs. 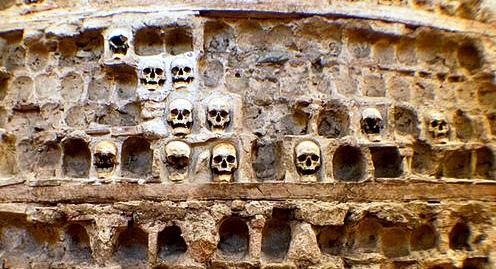 Fifteen feet (4.65 m) tall, and about 13 feet long and wide, there were 56 rows of skulls on all four faces of the tower, 17 skulls in a row (for a total of 952). Initially the Turks guarded the tower closely, to prevent relatives from giving the skulls a Christian burial. Later on, however, they abandoned it to neglect and elements. It is said that between 1861 and 1864, Midhat-pasha wanted to dismantle the tower, but the local Turks thwarted him. When Niš became a part of Serbia in 1878, construction began on the chapel that was to protect the tower from further erosion. The chapel was finalized in 1938, and restored in 1989. Of the skulls originally built into the tower, only 58 remain. A skull said to belong to Sinđelić is preserved separately, in a glass case. "My eyes and my heart greeted the remains of those brave men whose cut-off heads made the cornerstone of the independence of their homeland. May the Serbs keep this monument! It will always teach their children the value of the independence of a people, showing them the real price their fathers had to pay for it." (from "A Pilgrimage to the Holy Land... Made during a Tour in the East in 1832-1833" Published in London, 1835, vol. 3, pp 105-106). But as time went on, the world changed, and many things that should not have been forgotten were lost. Today, their own government tells the Serbs they should value comfort over freedom, material goods over dignity, pleasure over honor. In just the last twenty years, over a million Serbs have been forced from their homes and dispossessed. First forced into Communist-imposed borders, Serbia itself is now being partitioned anew, as its province of Kosovo was occupied by NATO in 1999 and declared an "independent" Albanian state in 2008. The very real suffering of Serbs in Ottoman times, during two German occupations in the 20th century, and in the wars of the 1990s, is routinely dismissed or minimized, even as Serbs are accused of committing wholly fabricated "genocides" against their neighbors, who somehow always happened to serve the conquering outsiders. The Skull Tower is not just a reminder of the steep but necessary price of freedom. It is also a monument to the brutality of the supposedly "tolerant" and "multicultural" Ottoman Empire, and the horrific institution of devşirme that produced psychopaths like Hurshid Ahmed Pasha. Those who seek to conquer the Serbs ought to take a long, hard look at this monument. The Turks once believed their dominion would last forever. But in 1815, another uprising began. By 1830, Serbia was an autonomous principality. In 1878 it was recognized as independent. And in 1912, the Ottoman Empire was chased out of the Balkans at long last. So long as a people value freedom, they can either prevail or perish, but can never be conquered. Isn't it true that Skenderbeg (Skenderbej, or Georgios Kastriotis, or Georgi Kastrioti) was born to a Greek father and Serbian mother? By the way, I am sure you have noticed the trend of Western documentaries to portray Turks as good and tolerant, and peoples who fought for their freedom such as Greeks and Serbs as brutal, barbaric, backwards, and chauvinistic. For example, in documentaries about Cyprus, or when discussing Balkan wars from previous centuries, including the ones you mentioned. Yes, it's interesting how that works out. I also remember reading somewhere that Skenderbeg was a Slav and that he converted (back?) to Christianity before his death. On another note do you think Serbs are forgetting their history? Every Serb I've met and discussed politics of the Balkans with seems to know their history. When I went to the rally in my city (Ottawa) to pressure the Canadian gov't not to recognize the Kosovo "state", I saw lots of young Canadians of Serb descent out in the awful snowy weather that day. It made me think that maybe their parents and grandparents make sure they understand who they are and where they're from. Oh, no doubt Skenderbeg was a Christian when he fought the Turks - a Catholic, if I'm not mistaken. As for history, I daresay your Canadian Serb acquaintances probably had a better grasp of things than people in today's Serbia, taught to celebrate defeats, forget victories and disparage everything that's made the Serbs endure through the ages. somewhere in the late 70's when my parents took me to see their home village in serbia they also took me to see a small house next to the primary school they attended in that same village. that house was where Stevan Sindjelic had lived during his childhood. they had told me about his heroics and all but at 10 years old i dind't understand much. Today after all we serbians, home mostly but also abroad, had to endure the understanding of his acts couldn't be more clear to me. I'am proud of my roots, my ancesters and thank you Stevan. You defended serbs your way then. Thank you gray falcon for doing it your way now. If only serb leaders today could do the same. that Village is selo Grabovac near the town of Svilajnac where they erected a monument in his honour. I wonder if Tadic saw it when he went there once for relection. if he did it looks like he didn't understand much. "So long as a people value freedom, they can either prevail or perish, but can never be conquered." In a paradoxical way Ottoman oppression has done much for preserving the Serbs' identity. That was the case with Greeks, Bulgarians, and Romanians too, for there never existed any doubt that Islam and Christianity cannot be reconciled. Serbs found their identity through the Church. Right now that is not the case. Serbs, by and large, are latching onto the snippets of their history, entirely out of context, with an utterly uncritical eye as to the issues that the West is facing. Serbs simply want to be regarded as Westerners, one of the boys, at any price. I hold little hope for the survival of Serbs as a nation and a significant cultural element of Christendom. That lack of hope is your right, Simon, but for what it's worth, I do not share it.